HEAVEN forbid, but imagine for a moment you were taken ill and had to go to hospital. When you arrive at the hospital, you discover that the specialist in the area you need treatment for is away at a medical conference. Are your chances improved or worse because of that? That's the question that kicks off a recent episode of Freakonomics, an award-winning podcast that tilts its head at the world and asks things a different way. 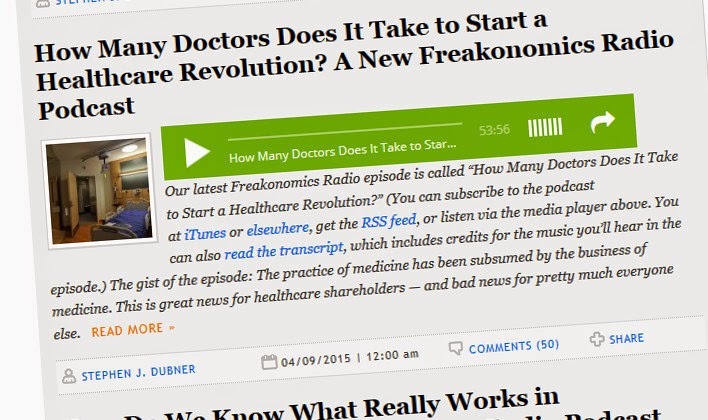 This particular episode – How Many Doctors Does It Take To Start A Healthcare Revolution? - takes a look at a subject that is timely as The Bahamas considers a new National Health Insurance plan, the world of private healthcare. The presenters ask excellent questions leading to very pointed observations. For example, they point out such things as that if a surgeon takes a few minutes to explain to a patient or their family what is going to happen, then that's lost money for the hospital. The private system thrives on machines being used and on beds being filled, the things that can be charged for on your health insurance. But is that the best way to look after the needs of the patient? Prevention can't be added to your bill, only cure. In Princeton, two billion-dollar hospitals have recently been built, both filled with lots of beds so there is always a bed available and the presenters note that if you go to one of those hospitals for treatment, the chances are high that you'll end up staying in a bed overnight – even if you don't really need it. Why? Well, your insurance is paying for it, right? And so the hospital can charge for it. Now some of these factors may be unintended consequences of how the system works, but it's clear there are hiccups in the operation of it that show that not everything is working out to the benefit of the patient in all ways. Oh, and that question about the absent specialist? It was based on a study on what happened when heart specialists were away at conferences. The result? Survival chances went up. Go listen to Freakonomics to find out more – it's thoughtful, not a diatribe, and asks questions, it doesn't insist it has answers. Another podcast that takes a slightly unusual look at the world is Home of the Brave, the podcast of Scott Carrier. The episode I started with was “The Cover-Up”. For those who don't know of Banksy, he's a guerilla artist, whose work is part graffiti, part genius. 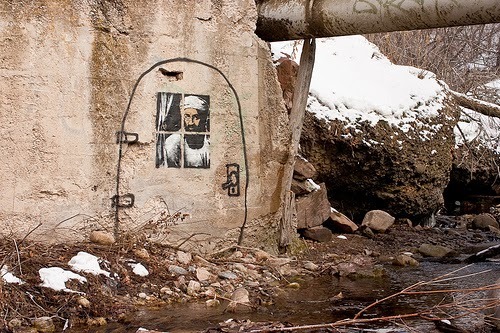 One of his works was a painting of Osama Bin Laden, on a broken down piece of wall under a bridge in a walking area just outside Salt Lake City. It showed a graffiti door with a window at its centre, out of which a painting of Bin Laden grimly peered. And it got painted over. Carrier puts the question to passers by as to what they think of the art and its destruction, with tantalising responses. The episode also spends quite a lot of a time with a chap called Alex Caldiero, described as a Sonosopher, who speaks at length on the philosophical implications of the destruction, before taking up something to scratch out his own tribute on the wall as a testimony to the invisible. Sometimes, podcasts live out their welcome, but StoryCorps is the opposite, there's just enough for a taste, and sometimes you are left longing for more. The episode I first listened to took a look at the 20th anniversary of the Oklahoma City bombing by Timothy McVeigh. The blast killed 168 people and injured hundreds of others. Among those affected by the bombing were children at a day care centre at the site. Twenty years on, those children who survived – only six of 21 present - are now full grown, and the show speaks to some of those who were there. The children were too young to really know what was going on at the time, but as they grew up, they learned about it and how they fitted in with it all. One youngster talks of the pressure to not only make his parents proud, but also not to waste the opportunity he has when so many other children had that opportunity taken away from them. Another survivor, who suffered serious burns and broken bones and was left in hospital for three months when only a year old, talks of never really understanding what he was part of, and his father reveals this is the first time they have really spoken of the bombing, because he felt personally responsible for what happened after saying to the boy's mother to take him to the day care because he was tired and needed to rest. Twenty years on and this is the first time that the son has the chance to tell his father not to blame himself. It's a fascinating, brilliant podcast, but it's over in ten minutes, just when you're wanting to know more.